Tartu University Centre for the Information Society and UT IdeaLab invite you to join in a search for solutions to various post-truth problems during a 24h hacking session, focusing on data journalism and innovation of digital media infrastructure. Since post-truth phenomena are an interdisciplinary challenge, we want people with different academic and professional backgrounds to participate. The 24h event will be held at the Spark Centre, Tartu, starting with a kick-off for the teams on Friday, March 31, and closing with awards for the best solutions in the evening of April 1. The outcomes of the hackathon are expected to be either 1) pieces of journalism making extensive use of data, facts and other evidence—doing it in a way that uses the possibilities offered by digital media in a clear and engaging manner or 2) innovative proofs-of-concept to improve the digital media infrastructure. Anything that falls somewhere between these two categories is welcome too and you are encouraged to pick up any of the controversial and hotly debated topics of immigration, gender gap or climate/environment issues, etc, which can be addressed and sorted out using more data and research. We need data analysts and visualisers, designers, developers, journalists, social scientists and specialists with other types of skillsets to effectively tackle various post-truth problematics. 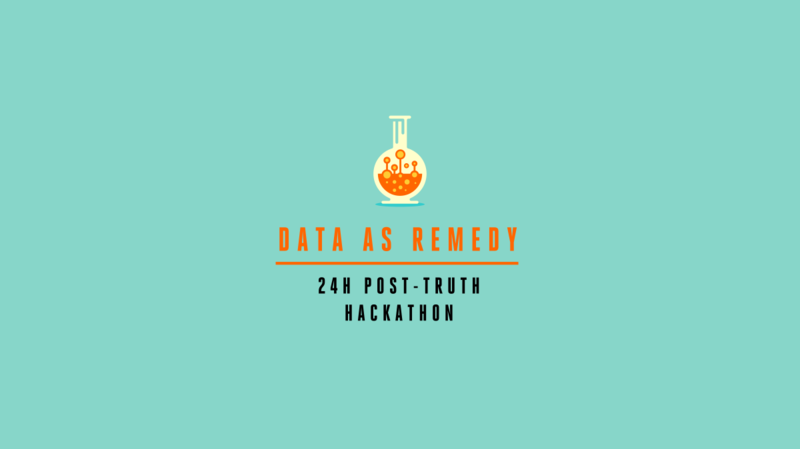 We chose "Data as Remedy" as the theme of the hackathon because we strongly feel that, since the problems of post-truth are intimately entwined with the information society, we also have to search for solutions using the means provided by modern information technology. However, it is not always self-evident how certain claims are supported by data and how facts are shaped by different interpretations or theoretical frameworks. This is where social sciences and humanities are needed to calibrate possible solutions. Bring your ideas and experience to our 24h hackathon to innovate the digital media sphere and find solutions to its problems! The event is organised by Tartu University Centre for the Information Society and UT IdeaLab in partnership with Open Knowledge Estonia, Creative Estonia, Postimees, Eesti Ekspress, Estonian Public Broadcasting, Semiosalong, etc.